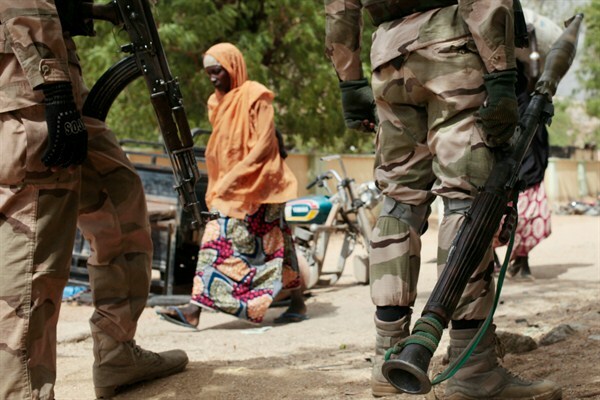 A woman walks past Nigerian soldiers at a checkpoint in Gwoza, Nigeria, a town newly liberated from Boko Haram, April 8, 2015 (AP photo by Lekan Oyekanmi). The epicenter of the Boko Haram insurgency, Nigeria’s conflict-wracked northeast, did not erupt in celebration following the Dec. 23 announcement by President Muhammadu Buhari that his country had “technically” defeated the jihadi group. On the streets of Yola, the capital of Adamawa State, security personnel were out in force the next day, presumably to prevent Boko Haram from carrying out attacks during the holiday season. Residents of nearby internally displaced persons camps, meanwhile, expressed apprehension at the prospect of returning to their homes, due to concerns over the ongoing armed conflict between Boko Haram and the Nigerian military along the border between the northern states of Adamawa and Borno.